Welcome to the other side of the big day, I hope it went well for you and yours. Three matches in eleven days is one thing, three interprovincials in eleven days another, but three interprovincials in eleven days which serve as your only bridge between one pair of crucial European fixtures and the next is something else entirely. Yes, I know Leinster in particular is blessed with a squad depth that has to be the envy of the continent, but no matter how much talent you have, that punishing schedule means a host of chopping and changing is necessary which isn't good for any team's rhythm. But within the confines of this classic derby, it's the same for both sides I suppose. 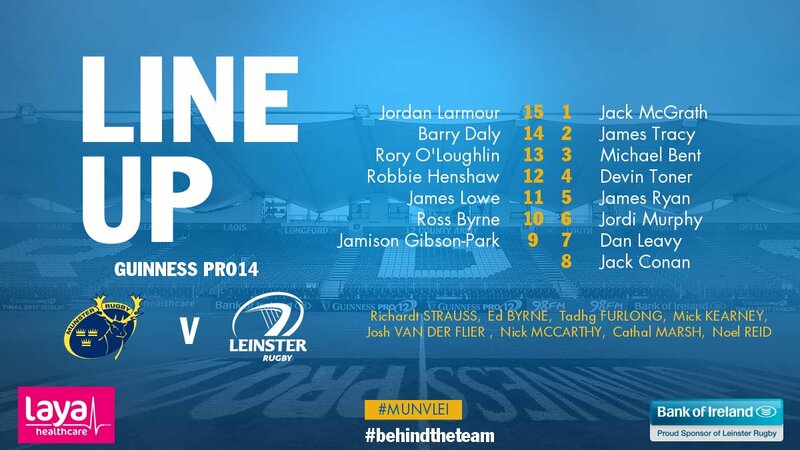 Normally you'd say the smart move would be to pick the strongest lineup for the home fixtures, yet with the trip to Thomond landing first on the schedule ahead of two dates at the RDS, this makes things a little more tricky. Maybe it wouldn't be the worst thing ever to rest key players for the New Years' Day clash with Connacht but not only will they be better rested having played on Saturday but the Westerners' big win over Ulster will fill them with belief that they can end a long barren spell in D4. One thing is for sure...in the race for top spot in Conference B, we can ill afford to lose two let alone all three of these matches, however wedged they may be in the twelve days of Christmas. 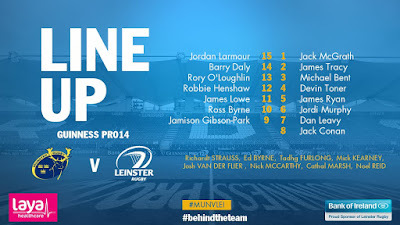 But for now we must focus on today's battle in Limerick...Munster need no extra motivation to be ready for our arrival but they certainly have it in that not only will they be keen to reverse what happened in the Aviva, but they also have a rare chance to gain some ground on Glasgow who just had their winning bubble burst by Edinburgh. While our matchday squad features many changes from that which did the double over Exeter, it still looks like one that can be competitive this afternoon, once they can rise to the occasion. In the likes of Robbie Henshaw, Jordan Larmour and James Lowe we're not short of game breakers...but what they need first is the ball so not for the first time this season the difference will probably come from the forwards. You just know players like Peter O'Mahony and Dave Kilcoyne are going to inspire those around them so it's vital that we at very least match them at the breakdown. We've seen these matches go south very quickly if we're not there competing for every ball right from the kickoff so a lot falls on the shoulders of the Dan Leavys and the James Ryans to keep us in this one. The bookies have a home win by six points...I totally see the logic in this, but then again since when does logic play a part in partisan provincial punditry? I reckon we can nick it by 2 to 4 points, but only if we start well otherwise we could well have the Christmas stuffing knocked out of us.